Last week we got back from Japan, where we travelled together with about thirty other European technology companies to find out more about the country’s railway industry market. Organized by EU Gateway, the trip included a one-day trade event known as Mass-Trans Innovation Japan 2017, and nearly twenty prearranged meetings with local businesses. Even though we submitted to EU Gateway a list of the companies we’d like to meet with, it was still rather difficult for us to set concrete goals for the export promotion trip before we actually got on the plane. However, now that we’ve returned from our trip, one feeling prevails: we are positively surprised. We still find it hard to believe that all but one of the meetings we had set up turned into potential collaborations. Further discussions are now underway. Mount Fuji, the famous volcano in Japan. The trip was such a success because of two factors: good organization on location, plus the briefing we received beforehand concerning the Japanese market. For both of these, we would like to extend our warm thanks to EU Gateway. 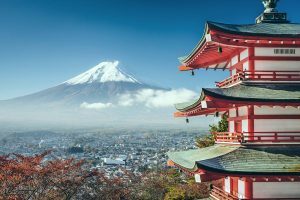 Firstly, any company aiming to break through in the Japanese market must bear in mind that in Japan, business is done in Japanese, and preferably through a Japanese middleman. In such a set-up, it is even more important for a company producing tailor-made solutions to find a good partner. Secondly, a Finnish company should in principle have all the required preconditions to succeed in Japan. In Japanese business culture, a strong relationship based on mutual trust must be built before partnerships can be formed. Building trust is a process that may take several years. We’re not saying that us Finns are particularly famous for our patience, but honesty and being as good as your word are definitely values we are no strangers to when building relationships and trust. Finally, we must point out one more thing: Japanese politeness is not a myth. They really do greet their guests with deep bows and shower them with endless thank yous. Meanwhile, of course, they also appreciate the politeness of their potential partner. 1) Be prepared and find yourself a partner that can help you when doing business with the Japanese. 2) Don’t expect to have your inbox immediately filled with orders. 3) Familiarize yourself with Japan’s business culture, because it is quite different from what you might expect.